Poetic labels can be applied to his work, though no single scheme does him much justice. I myself have written elsewhere that the transition from Tight Corners (1974) to My Poetry (1980) shows David moving from “a Black Mountain inflected lyricism to a language-oriented textuality.” But such divisions, with their tacit assumptions about progressiveness (lyricism = retro; textuality = advanced), flatten out the excitement of reading him. 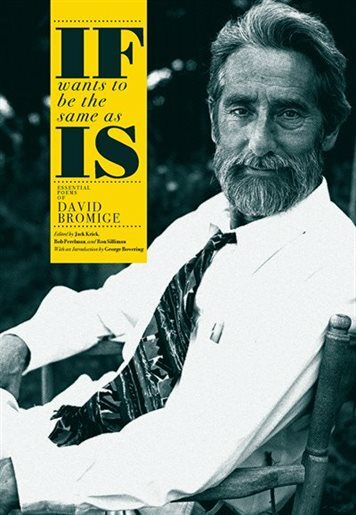 There isn’t any way to overstate the importance of the publication of IF wants to be the same as IS: Essential Poems of David Bromige, eds. Jack Krick, Bob Perelman and Ron Silliman, with an introduction by George Bowering (Vancouver BC: New Star Books, 2018), a six hundred page volume of collected works by the late David Bromige (October 22, 1933 – June 3, 2009). Bromige is a poet both seen to exist in Canadian and American poetries, and yet each side of the border had their own individual, and even incomplete, portrait of him and his work, comparable to considerations of poet George Stanley [see my review of Stanley’s 2014 title, North of California St., here], a poet who, himself, emerged in California before moving north to Vancouver. For the longest time, you might know, books didn’t cross borders easily, so my own engagement with Bromige and his work came solely through Canadian publications, such as Birds of the West (Toronto ON: Coach House Books, 1974)—a book I picked up from Janet Inksetter’s Annex Books somewhere in the late 1990s, and found quite generative for my own work for years—or Tiny Courts in a Year Without Scales (London, ON: Brick Books 1991), yet copies of his American titles, whether My Poetry (Berkeley, CA: The Figures Press, 1980), Desire: Selected Poems 1963-1987 (Santa Rosa, CA: Black Sparrow Press, 1988), Men, Women & Vehicles: Prose Works (Santa Rosa, CA: Black Sparrow Press, 1990) or The Harbormaster of Hong Kong (Los Angeles, CA: Sun & Moon Press, 1993) never quite made it onto the Canadian radar. then fall flat on my face. This once I’ll tell you why. because I want to harm you. Given the length and breadth of this collection, I’m a bit disappointed that it doesn’t include a bibliography, allowing a sense of the books and what-not (apart from the titles and years) that provided earlier publication. Are we to gather such through our own Google searches, perhaps? Titles and dates are mentioned, but not publishers, making one have to search out information through other means, which is a bit frustrating. Moving through some four decades of publishing history, IF wants to be the same as IS: Essential Poems of David Bromige includes work from The Gathering (Buffalo, NY: Sumbooks, 1965), Please, Like Me (Los Angeles, CA: Black Sparrow Press, 1968), The Ends of the Earth (Black Sparrow Press, 1968), The Quivering Roadway (Berkeley, CA: Archangel Press, 1969), Threads (Black Sparrow Press, 1970), Ten Years in the Making (Vancouver, BC: New Star Press, 1974), Birds of the West (Coach House Press, 1974), Tight Corners and What’s Around Them (Black Sparrow Press, 1974), Spells and Blessings (Vancouver, BC: Talonbooks, 1975), Credences of Winter (Black Sparrow Press, 1976), My Poetry (The Figures, 1980), American Testament (1981-86), P-E-A-C-E (Berkeley, CA: Tuumba Press, 1981), Red Hats (Atwater, OH: Tonsure Press, 1986), Tiny Courts in a World Without Scales (Brick Books, 1991), The Harbormaster of Hong Kong (Sun & Moon Press, 1993), Romantic Traceries (1993), A Cast of Tens (Penngrove, CA: Avec Books, 1994), Vulnerable Bundles (Hartford, CT: Cricket Press, 1995), As in T as in Tether (Tucson, AZ: Chax Press, 2002), Indictable Suborners (Sebastopol, CA: DPress 2003) and Ten Poems from Clearings in the Throat (dPress, 2005). Just to look at his bibliography on Wikipedia (which I could never presume to be complete, or even completely correct), this is only a fraction of his published work, which suggest even further publications could be produced down the road. This is an important book, one a long time coming. Given some of the attention provided to other poets across North America, might someone even be willing to organize a conference on Bromige’s work, now that such a book as this is finally available?